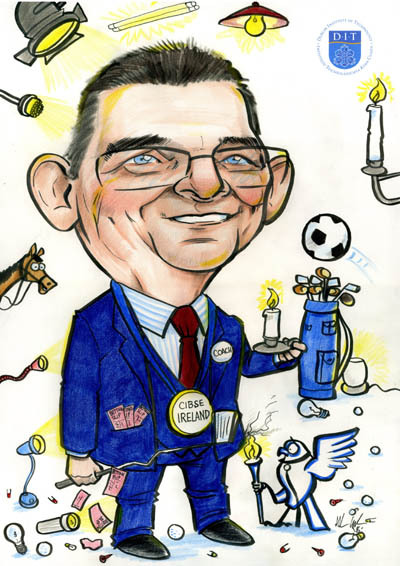 Coworker Retirement Gift Ideas Order Online Ireland: Framed Caricature! Coworker Retirement Gift Ideas – Caricatures by Allan Cavanagh! Coworker Retirement Gift Ideas: this caricature was for a retiring engineering lecturer from DIT and was presented to him by his colleagues last week. His area of specialty is lighting design so there were many lighting references made, from candles to LEDs! He also intends to play a lot of golf in his retirement so that too was incorporated with clubs in the background and tees and golf balls all over the foreground! I included the DIT logo and had some fun with CIBSE logo, which you can see singeing the edge of his blazer! He is a former football coach so that detail was included too. Caricatures are great retirement gift ideas for coworkers, and they are fun novelty retirement gifts. They are highly personalised retirement gifts. These Irish retirement gifts are also available to ship to the UK. They’re suitable retirement gifts for men and women from all industries and any details you like can be incorporated. They make cherished gifts and my work hangs in dozens of homes all over Ireland. Irish Open 2018: Rory McIlroy Heads to Donegal!